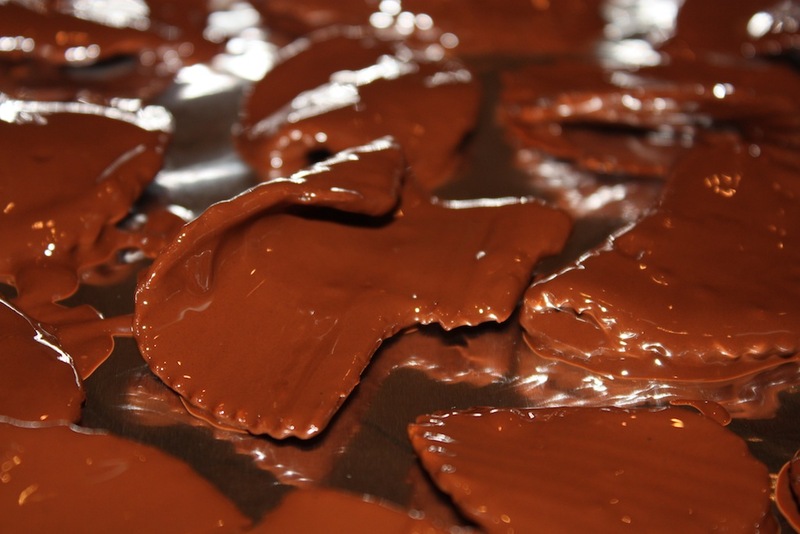 A few years ago I had been wandering through a chocolate shop and stumbled upon these perfectly gorgeous potato chips drowning in dark chocolate. It was as if my name was written on the little card in the display case, rather than a very high price tag. Of course, I did buy some. After all, is educating my children really that important? I got home and decided that I had to make some on my own. The question of which potato chip to use was answered pretty quickly. 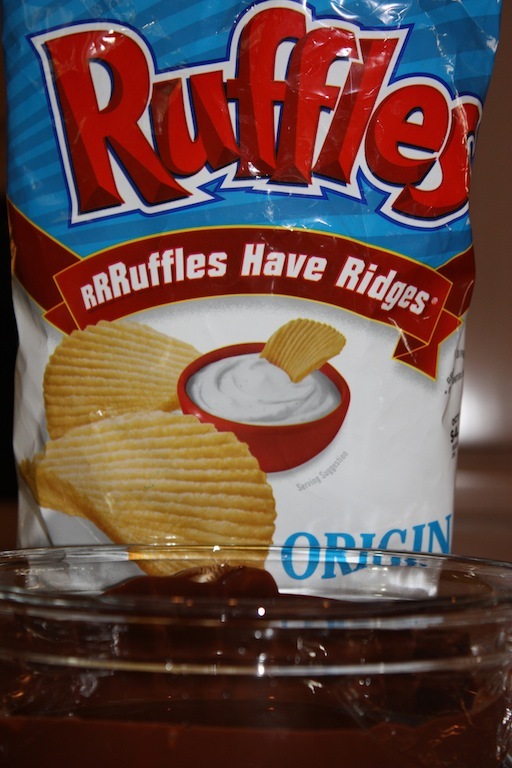 Ruffles™ potato chips are very strong, with those adorable ridges, and pack the perfect salt punch. The next decision was which chocolate to use. I generally prefer a more bitter chocolate chip to a semisweet or milk chocolate one and as I usually have several different kinds in my pantry, it made sense to try them all out. A difficult task, but I felt that someone had to do it so it might as well have been me. The bottom line, in terms of which chocolate to use, is simple. Use the chocolate that you love the most. 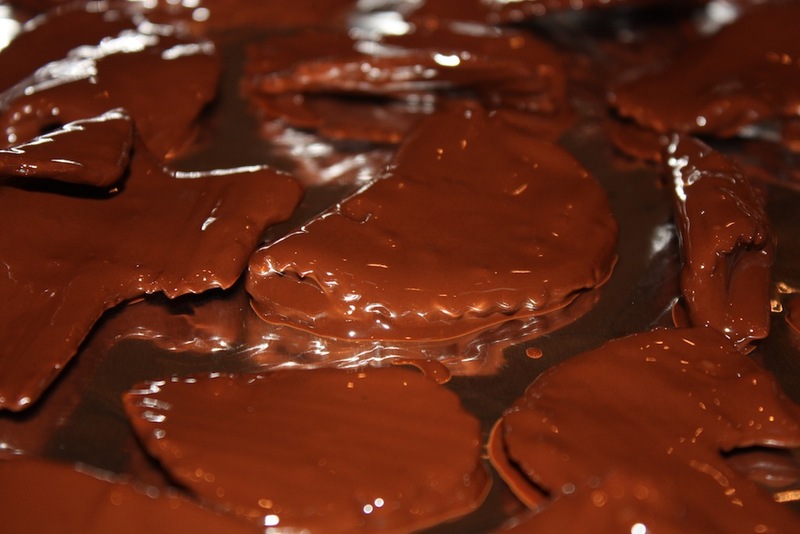 It is always nice for other people to enjoy what we take the time to make, however, since chocolate is one of the two most important ingredients in Chocolate Covered Potato Chips, make sure that the chocolate you select is one that you love! 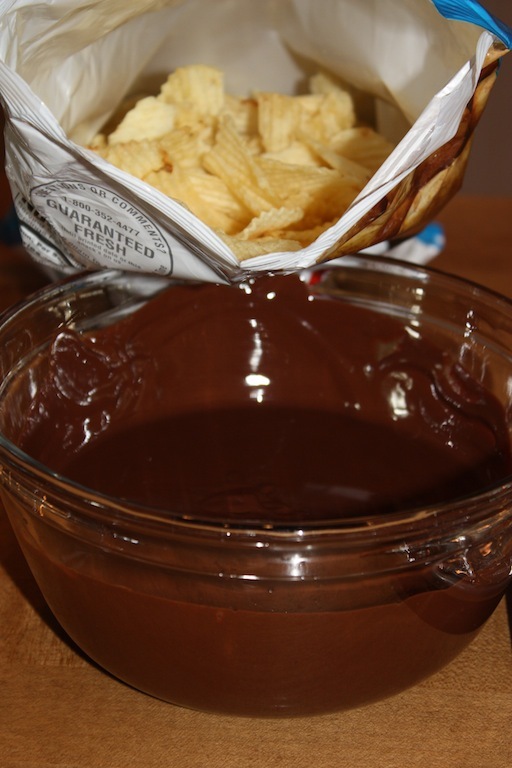 The next challenge was what to do with the leftover melted chocolate once the bowl was too shallow to do a decent job coating the potato chips. I thought of sticking my face into the bowl and licking away, but realized that might confuse the dog too much. 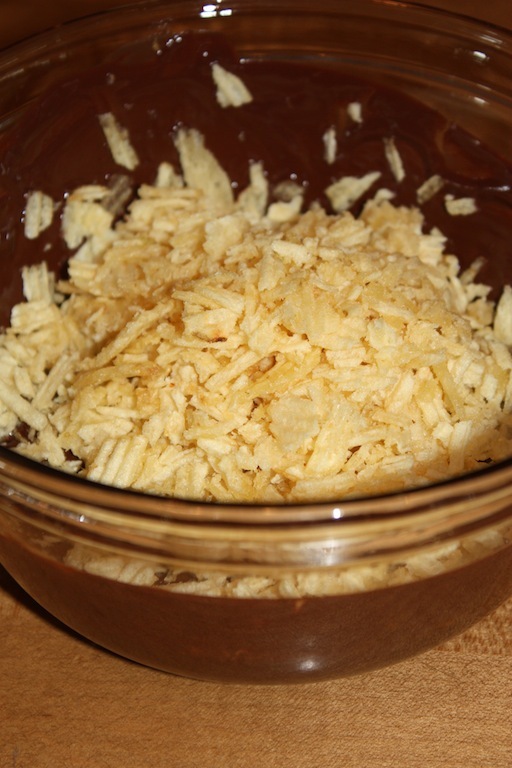 Then I looked into the potato chip bag and realized that there were still plenty of chips to play with, so I crumbled them up over the bowl and spooned out mounds of chocolate covered potato chip crumbs. Now I have a hard time deciding which way I like to eat them more. The single chips are beautiful to look at and I am able to nibble at them (not like I really have the patience to ‘nibble’ at these), but the mounds look like a challenge begging to be conquered. They are not precise little delicacies. Noooo, these mounds force you to find the right angle to bite that will allow you to triumph over the crumbled up potato chips coated with silky, smooth chocolate. Ughh, the decision is just too difficult. As hard as this is to believe, I actually do share the Chocolate Covered Potato Chips with others. They have become a staple when I entertain and they make beautiful hostess gifts wrapped in a pretty cellophane bag tied with ribbon. Sometime last year I took a bag of Chocolate Covered Potato Chips to my girlfriend Lisa’s house. Lisa is a mother of three girls. Yup, four ladies in the house with a bag of these goodies and they were not destined to be around for long. I have since become known as ‘the chocolate potato chip lady,’ a title I am very honored to accept. Recently, I went to Lisa’s house with a bag of treats and Lisa told me how she describes these to others: “love with salt and chocolate.” Amen! WARNING: THESE ARE HIGHLY ADDICTIVE! Line the bottom of a large baking sheet with aluminum foil and set aside. 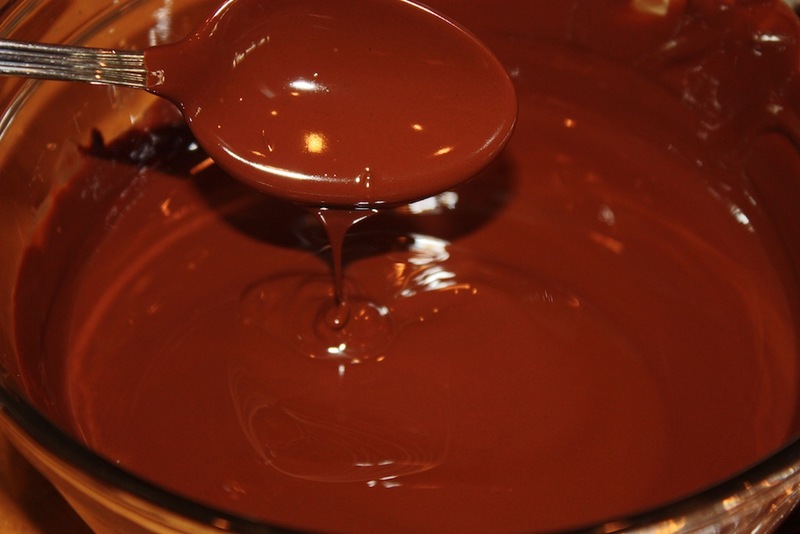 Melt the chocolate chips and vegetable oil together, either in the microwave or on top of the stove. 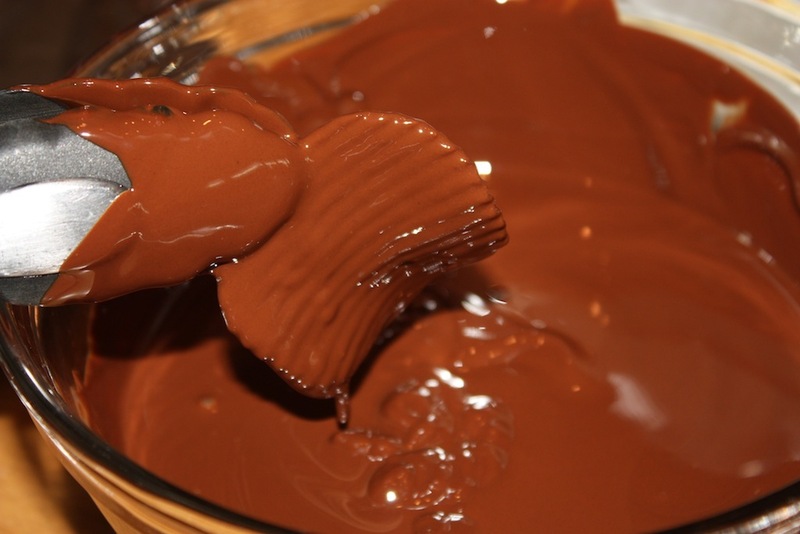 Using a pair of tongues, dip potato chips, one at a time, into the chocolate. Let excess chocolate drip off and transfer to the lined baking sheet. 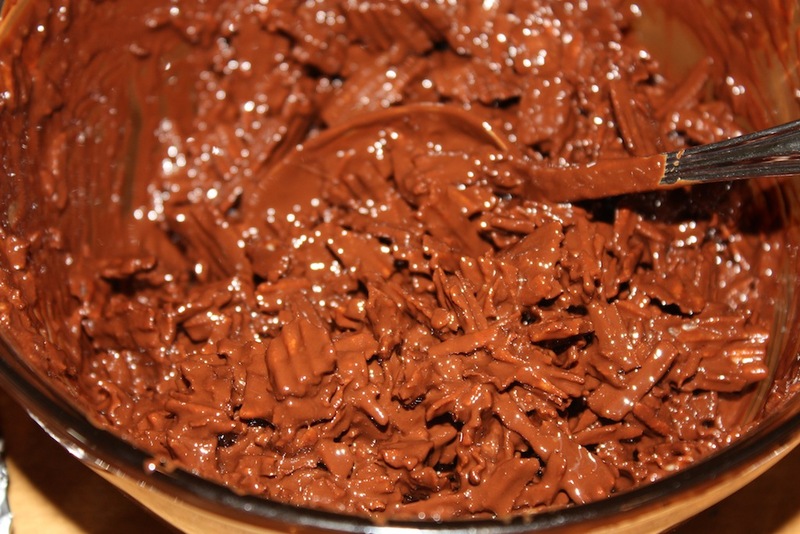 Repeat this process until the chocolate mixture is too shallow to dip any more chips into. 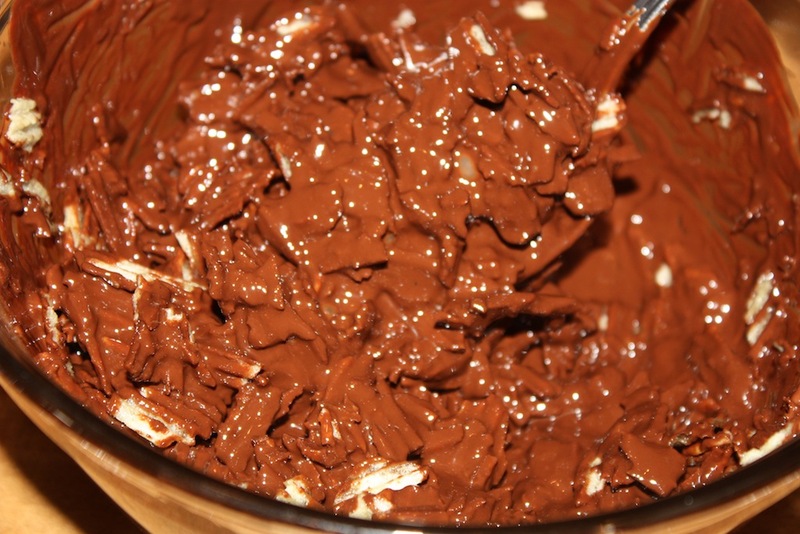 Crumble many potato chips together over the bowl of chocolate and stir the mixture until the chip crumbs are covered with chocolate. 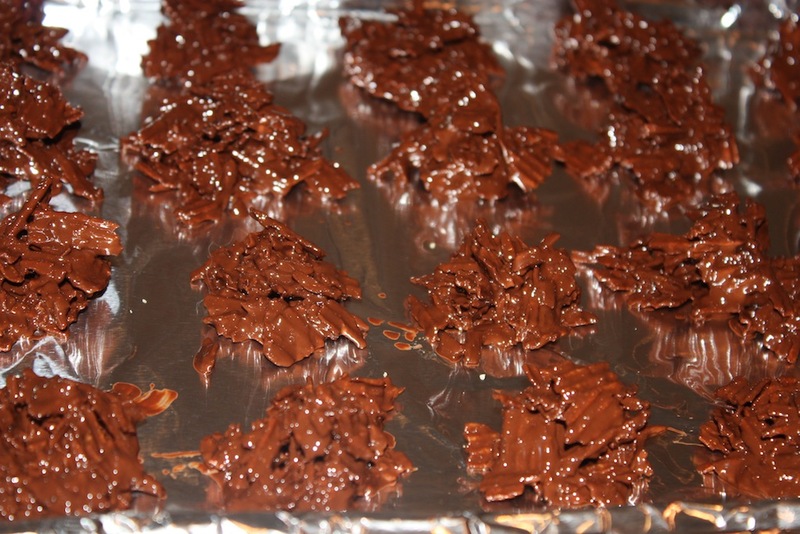 Use a spoon to make mounds of the chocolate covered crumbs and place them onto the baking sheet. Freeze until set and serve. 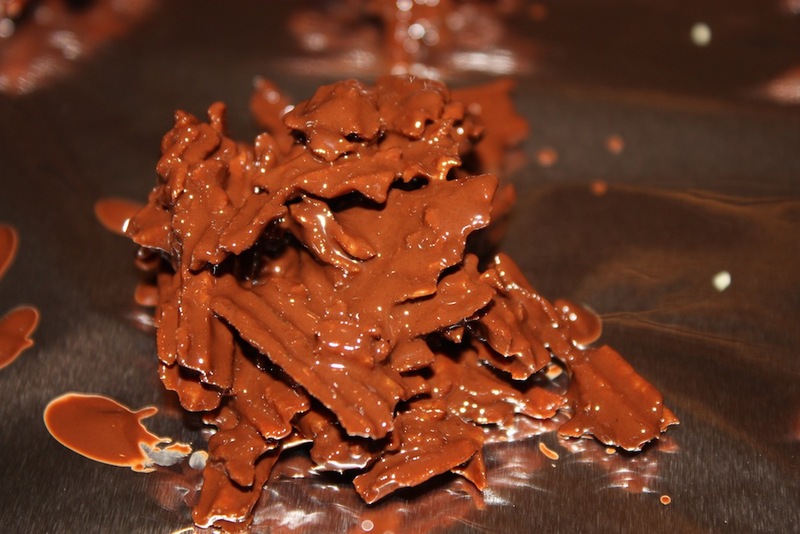 Chocolate covered potato chips keep beautifully in the fridge or freezer, if they are ever around long enough. The beauty of the individual chocolate covered chip is quite remarkable, but do not discount the chocolate covered mounds. 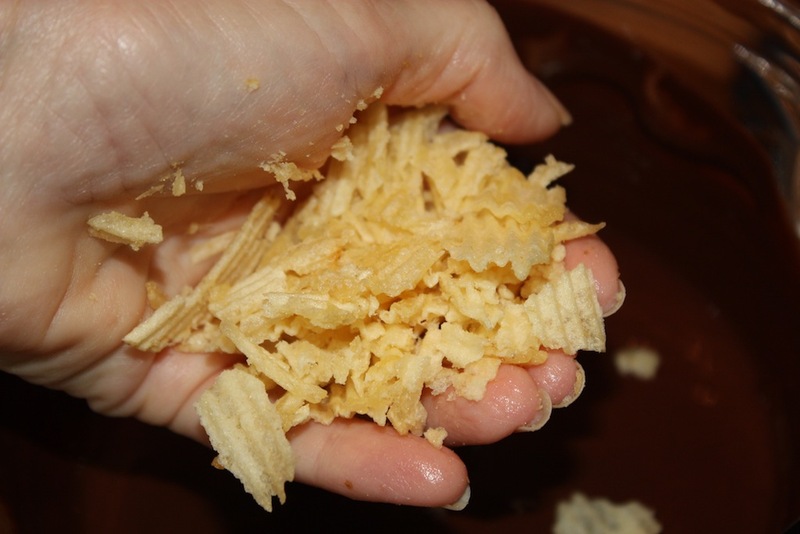 Their crunchiness teases all the same senses as the lovely chip, but with more punch to the bite, as you have to work harder for it. I have experimented with other potato chips and the others do not hold up nearly as well with the chocolate as Ruffles™ Potato Chips. The type of chocolate chip to use is a personal choice. Play with it and discover which chip is your favorite to use. LOVE LOVE LOVE your blog!!!!!! I LOVE, LOVE, LOVE your feedback. thrilled to see chocolate potato chips!!! now i can make these at home and make my dream a reality!!!!! yay. I feel the same way about eating these. Enjoy! These are amazing & friendly for gluten free users :-)! I love when you make them for me, too, Betsy! You spoil us. KJS, everyone needs to be spoiled periodically and it is important for gluten free eaters to have something incredibly decadent to eat, too! I tasted these at my friend Jessie’s and they were delicious. I want to make these these treats at my house! Thanks so much for your comment Eden. Have a great time making them!